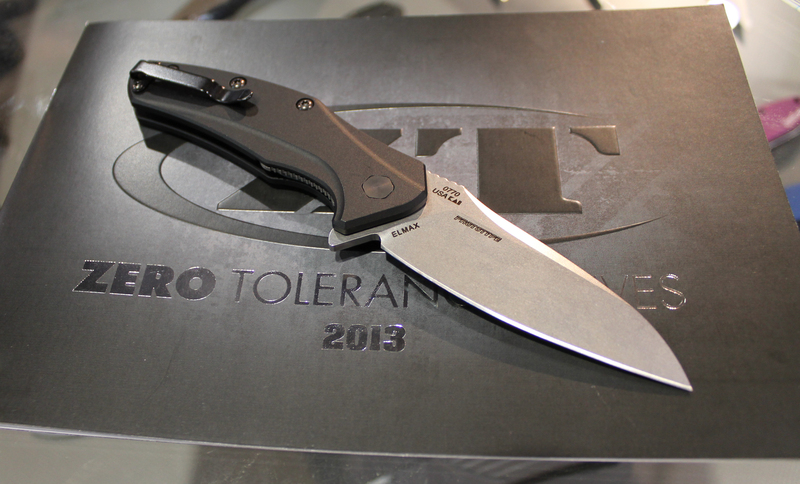 Zero Tolerance Knives, the Made in USA hard-use offshoot of KAI Group, Inc, was displaying a very nice mid-sized folder in their SHOT Show 2013 booth. 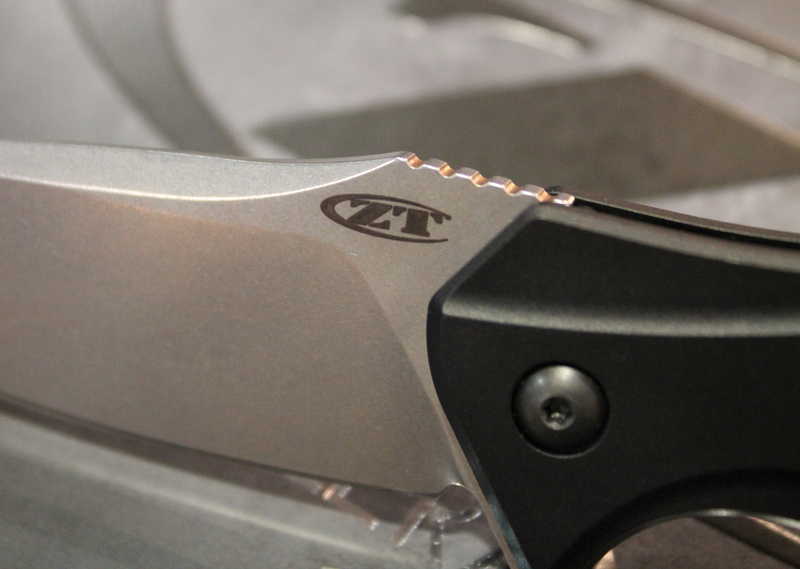 Rep. Andy Peterson showed me the prototype of the new model, which he said was a gentleman’s version of the Blade Magazine 2011 Knife of the Year, ZT’s 0777. 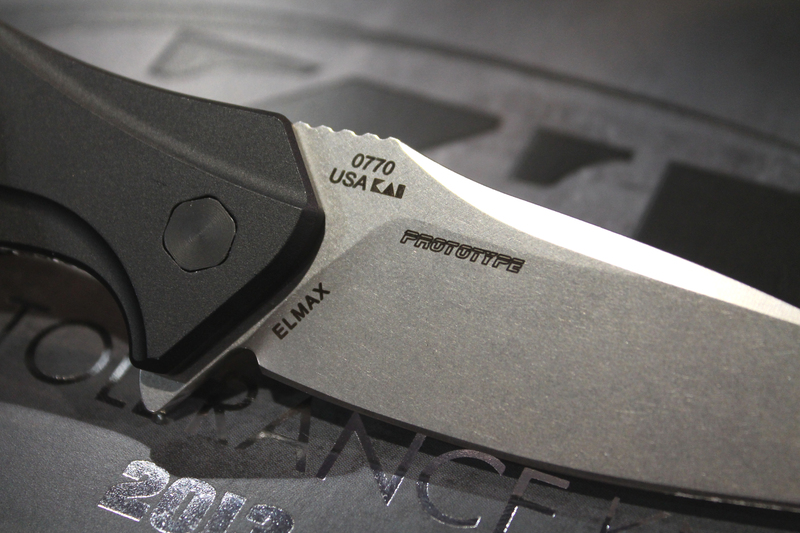 The new 0770 has a 3.25” stonewashed blade of Uddeholm Elmax® powdered steel. Elmax has high percentages of carbon, chromium, and vanadium, which result in high wear and corrosion resistance plus toughness. Rockwell harness of the Elmax is gauged at 58-62. I would call the blade profile a modified wharncliffe, having a slightly upswept cutting edge. 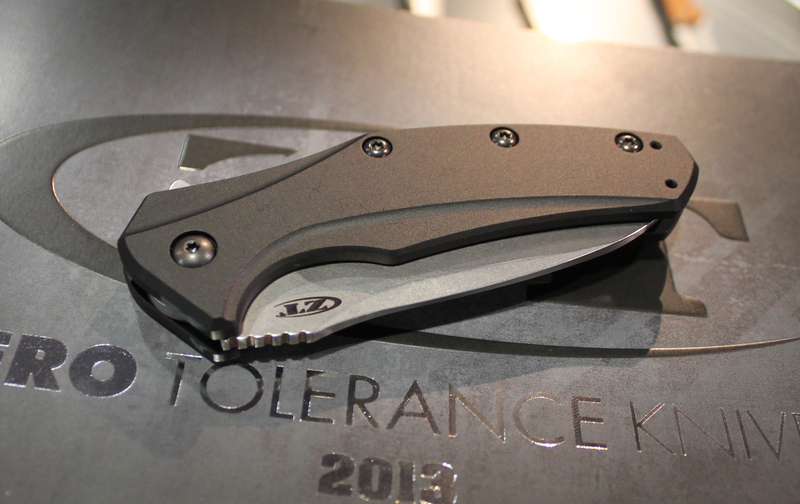 SpeedSafe® assisted blade opening is activated via a flipper. The liner lock is housed in dual 6061-T6 aluminum handles, which are anodized black. A reversible tip-up deep pocket clip and other hardware are blackened. The backspace is open and bridged by three bolsters at the screws. The handle contour has a nice arch at the midpoint that fills the palm. Machined sides of the handle aid in grip. The inverted flipper provides a guard for the index finger. Jimping on the back of the blade is available to the thumb. 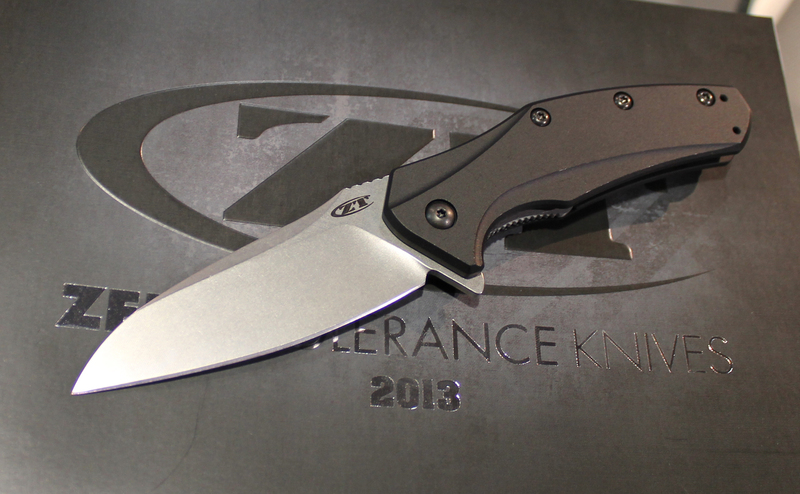 ZT states the knife is 4.32” closed and 7.57” opened. No weight is given, but my hand says it went about 3.3 ounces, give or take. MSRP will be $180.00, so look for it sliding into your pocket for less. 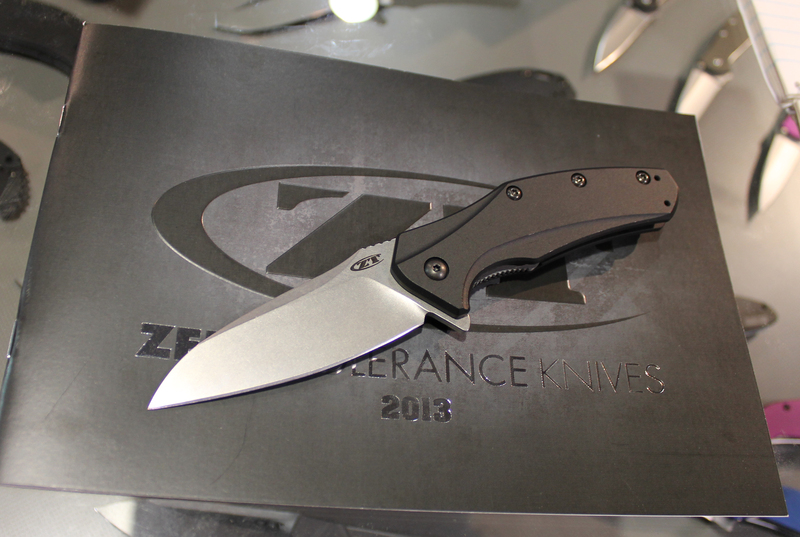 This entry was posted in Knives and tagged Folding Knife, Gentleman's Knife, SHOT Show, SpeedSafe, Zero Tolerance, Zero Tolerance 0770. Bookmark the permalink. Ce couteau de KAI Zéro Tolérance est absolument superbe. Il devrait être à moi dans peu de temps, si tout va bien! Ca me consolera de l’absence du ZT 0777 et surtout du ZT 0888. Nous autres, pauvres Français, n’avons pas beaucoup de chances d’en obtenir. J’étais sur le point d’acquérir un ZT 0888, grace à KATO Group (NL). Il m’est passé sous le nez, hélas! got mine today, very nice.